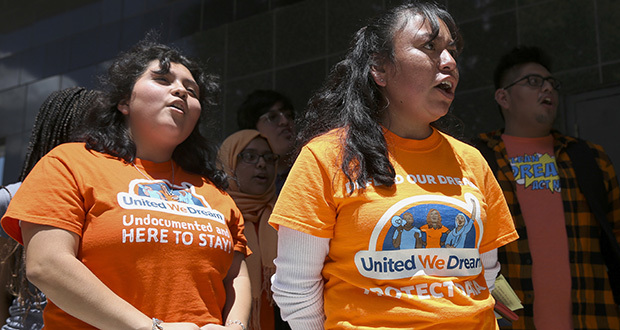 The struggle over the Deferred Action for Childhood Arrivals program and the fate of the immigrants known as “Dreamers” is heating up again. There’s a strong probability that it will go all the way to the U.S. Supreme Court, and fast — conceivably even before Judge Brett Kavanaugh gets a Senate vote on his confirmation. The path to the Supreme Court passes through the possibility of dueling nationwide lower-court injunctions. There are already orders mandating that President Donald Trump’s administration keep in place DACA, which shields from deportation certain undocumented immigrants who came to the U.S. as children. A federal district court in Texas could soon issue a contradictory order shutting it down. That seems likely, because it’s the same judge who in 2015 blocked Barack Obama’s administration from implementing the Deferred Action for Parents of Americans and Lawful Permanent Residents policy, or DAPA, which would have extended the DACA protections to Dreamers’ parents. To understand the looming crisis, you have to start with the rather remarkable fact that DACA is still legally in place, even though the Trump administration ordered it shut down in September 2017. The reason that’s so remarkable is that DACA isn’t a law passed by Congress. It’s a unilateral presidential enactment adopted by Obama. Ordinarily, what one president can do by fiat, another can undo by fiat. But in January, a federal judge in California ruled that the Trump administration had acted arbitrarily when it shut down the program. He ordered that DACA remain in place. Since then, a couple of other federal district courts agreed. I won’t bore you with the disagreement, which centers on whether the Trump administration gave a good enough reason for shutting the program down when it asserted that DACA was illegal. What matters practically is that the courts’ orders kept DACA going despite Trump’s wishes. That led directly to a new federal lawsuit, filed by Texas and seven other states, arguing that DACA is in fact unlawful, because it exceeded Obama’s presidential authority. A hearing the case took place Wednesday. It’s pure luck, but the judge who drew the case, Andrew Hanen, is the same judge who struck down DAPA. The U.S. Court of Appeals for the 5th Circuit upheld his opinion in that case. And the U.S. Supreme Court then split 4-4 after Justice Antonin Scalia died, leaving the appeals court ruling in effect. There can be little doubt that Scalia would have voted to strike down DAPA. As a matter of constitutional logic, if the program for parents was beyond Obama’s presidential authority, so was the program for their children. And Hanen has already demonstrated his willingness to issue a nationwide injunction enforcing his ruling. So it’s a pretty safe bet that Hanen will at some point rule DACA unconstitutional. That leaves the question of timing — which could be all important here. DACA supporters are arguing to Hanen that unlike DAPA, which had not yet been implemented when Hanen blocked it, DACA has been in place for several years. Therefore, they maintain, there is no immediate need for a preliminary injunction because the states are suffering no irreparable harm from continuing the program. I’m skeptical that Hanen will embrace that distinction. He previously ruled that state resources expended on DAPA were harmful enough to issue his injunction. States are also spending resources on DACA. If and when Hanen strikes down DACA and orders a nationwide injunction against it, the Trump administration will be whipsawed between competing court orders. Some courts are ordering it to keep DACA going, and Hanen would be ordering the opposite. In the face of contradictory orders, the administration would seek expedited review by courts of appeals. If those didn’t create uniformity immediately — and that is the most likely outcome — then it would turn to the Supreme Court. After all, the high court’s job is to ensure some modicum of legal uniformity across the country. All that could happen within days or even hours of a ruling and injunction by Hanen. And Hanen could perfectly well rule at any time. He’s already thought through the constitutional issues in issuing his DAPA opinion. Nevertheless, Hanen can use his discretion to choose when he wants to issue a decision and an injunction. And he has a pragmatic reason to take his time. That’s because the Supreme Court is evenly split again, as it was when it voted on the 5th Circuit decision upholding Hanen’s DAPA ruling. If the current Supreme Court had to consider dueling nationwide injunctions, it could face a serious crisis if i again divided 4-4. A split court can only uphold the decision on appeal before it. If a 5th Circuit decision upholding a Hanen opinion remained in place, it would put the Trump administration into a legally untenable situation. Of course, moderates like Chief Justice John Roberts and Justices Stephen Breyer and Elena Kagan could hammer out a temporary compromise. But such a compromise would almost certainly have to include keeping DACA in place. So it makes sense for Hanen to wait until Kavanaugh is confirmed, and then issue his ruling. If that’s what happens, Kavanaugh may have to swing into action pretty darn fast. He would face his first controversial, emergency vote in a high-profile case where his vote would be decisive. It won’t be his last. Noah Feldman is a Bloomberg Opinion columnist. He is a professor of law at Harvard University and was a clerk to U.S. Supreme Court Justice David Souter. This column does not necessarily reflect the opinion of Minnesota Lawyer, the Bloomberg editorial board or Bloomberg LP and its owners.